After waiting in line for 9am early entry to the Expo and taking about 20 minutes to move up in line enough to be inside the D23 Expo, we began tackling the shopping. We started with about a 20 minute line for the Disney Store. The line into the store area was wheelchair accessible. Inside the store it was mostly accessible, although it was hard to get to the edges. However, the stuff on the edges was mostly extras of stuff you could get from the middle area. Mik and I have both avoided buying Vinylmation in the past. We have looked, but the only ones I ever sort of watned were the penguins, but they are both part of series that you do not know what you get until after you buy and open it. Mik has really been wanting a Vinylmation for his miniature collection, but only saw one he actually liked yesterday at Disneyland. However, we both refused to buy anything until after the Expo. There was not much of interest for us in the Disney Store, but Mik instantly wanted the Vinylmation. 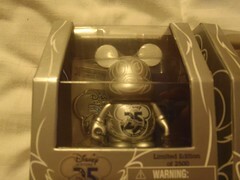 It is a cool silver 25th Disney Store Anniversary one. What he really liked was it also came with a pin. I ended up also getting one because I wanted a pin and did not like the big one sold on its own. It was about the same price as just the big pin, so I figure I might just sell the Vinylmation or maybe I could trade it for a penguin one. Maybe, I will just keep it, though, as it is kind of cool. 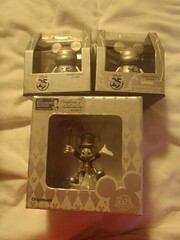 Mik also fell in love with the Expo exclusive 25th Anniversary ornaments. He thought for sure I would want the Sorcerer Mickey one, but I felt it was too pink looking. 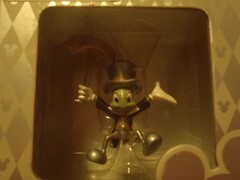 Mik thought about getting it anyways, but ended up settling on the Jiminy Cricket one. I kind of thought he would go for the Buzz Lightyear one, but it also had pink, which was even odder. When we got to the checkout line, I was worried it would be annoying because it was set up with little room to go through the queue. I thought we might have to keep moving the pedestals like we had to at the Twins Team Shop. However, when we got to entering it the Cast Member had us cut the line to the front. It was still kind of awkward because we had to go against traffic coming out to the register and then after paying had minimal room to turn around and get out, but everyone was friendly and it was better than having to try to squeeze through the queue.